We struggled mightily. . .and we won! Just as Jason of Lolcus required the sorcery of Medea to complete his tasks to obtain the Golden Fleece, our Jason of the Robots required Medea’s help too. One objective of the mission was to repair a CORK, numbered 1027. To do so, the "top hat" needed to be extracted to remove a broken data logger and install a new one. Well, the top hat and data logger were somewhat fused together and Jason wasn’t strong enough to lift both out. A few days later, the Atlantis returned to the site with the idea to jury rig Medea into a lifting machine of might. After consulting Woods Hole, the Jason team, etc., a system was designed to be able to attach ropes to Medea and the top hat without breaking both. 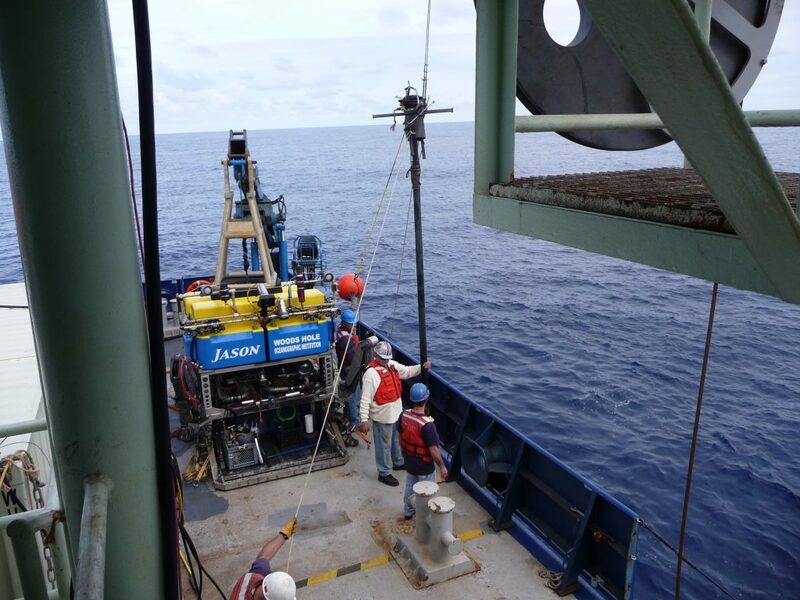 Medea lifted the hat/logger combination easily, bringing them to the surface, where it took about an hour of operations to bring robots and instruments aboard safely.